Much like paying rent, you've got no choice but to show up at Applebee's every month and give them money for their new Neighborhood Drink special. Except instead of paying hundreds of dollars for shelter, you're paying a single dollar for a cocktail that's sure to make you say something you'll regret. Actually, maybe the only thing it has in common with rent is that it's non-negotiable? Whatever, the point is the $1 drink for February has just been announced, so it's time to go Applebee's. 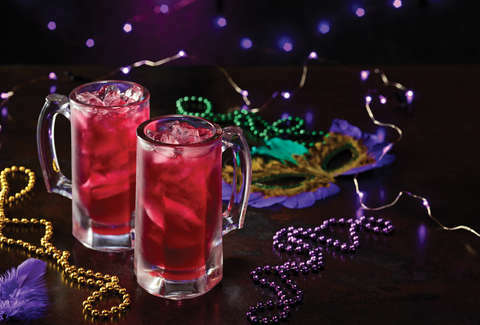 February's Neighborhood Drink of the month is the Hurricane, a Mardi Gras-themed alcoholic beverage that will be yours for the price of a single dollar. These New Orleans-inspired cocktails will be available a little longer this month -- from February 1 till March 5 -- because Mardis Gras isn't until March 5. The Hurricanes come in a 10-ounce mug and are filled with rum, passion fruit, orange, black cherry, and lime juices. That sounds like kind of a lot, but you're kind of a lot, so that's fine. It'll also come with a masked stirrer or Mardi Gras beads (but like, not in that way). It's all very festive and joins the venerable ranks of such famed cocktails as $1 strawberry margaritas, $1 Long Island ice teas, and $2 Rum & Colas. Anyway, you can't afford not to buy them, so the details don't really matter.